The Press Gallery have been busily, emphatically, excitedly making the most of the new leadership tensions story that Abbott has gifted them over the past few weeks. 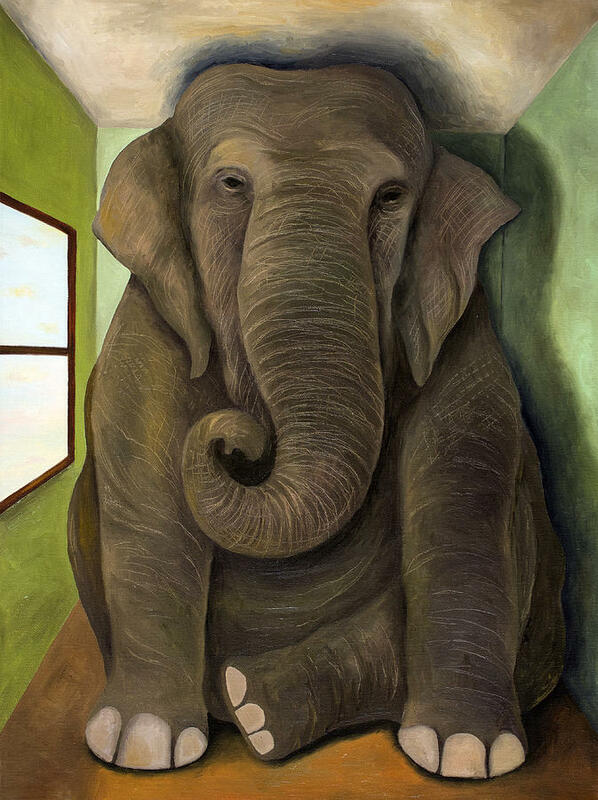 But amongst the innumerable number of articles about what’s gone wrong for Abbott, how he got to this point so quickly in his first term, and what he plans to do to fix this mess, there are some massive elephants in the Press Gallery who are being consistently ignored. In fact, there are enough elephants to build a pretty decent circus, if you throw in the journalists as the clowns. Abbott’s ‘budget emergency’ is a lie he has used to justify cutting government spending for ideological reasons, at a time when the economy needs stimulus, not cuts. This fake ‘budget emergency’ has decimated consumer confidence and has reduced the amount of money in the economy to the point where Australia is teetering on the edge of a recession. Put simply, Abbott has ideologically wrecked the economy because he prefers small government. That jobs can be created by the unemployed applying for more jobs. There are 5 unemployed people per available job in Australia. People want to work and there are no jobs for them to work in. Tax cuts for the rich create jobs. No, they don’t. Demand from consumers create jobs. Tax cuts for the rich just make the rich richer, and inequality worse. If consumers can’t afford to spend, the economy grinds to a halt. Wealth trickles down. No it doesn’t. By next year, the 1% richest people in the world will own half the world’s wealth. There is no trickle. Government spending and taxation is like a household budget. No it isn’t. If you haven’t heard of Modern Monetary Theory yet, follow this link. Abbott is failing to get his budget through the Senate, not because Labor controls the Senate, but because right wing minor parties, those who traditionally supported (and in one case funded) the Liberal National Coalition, are refusing to pass policies they know are so unpopular that they would threaten their political careers putting their names to them. It’s really as simple as that. Abbott never properly defined what he would do as Prime Minister because he knew if he told the voters what he really wanted to do, ideologically, to the Australian economy, culture and society, he would never have won the election. The Press Gallery ignore this elephant because to point it out would be to also admit that they never scrutinised Abbott in the lead up to the election since they were too busy writing about Labor leadership tensions. The first rule of political journalism in the Press Gallery is ‘never ever admit you were wrong in the past’. Anyone with eyes could see exactly what the Abbott government was going to be like and if you followed independent media sites like this one you would have got a very accurate preview of the situation we are in now. But you never got this preview from the mainstream media. And the last thing they want to do now is to admit they were the reason the electorate got such a shock when they realised who Abbott really is, and what his real plans for this country were. There are things Australians should be scared of, and there are other things Australians should stop being scared off. We should be scared about Climate Change. We should be scared about wealth inequality. We should be scared about our own and future generations’ ability to find jobs in an economy where manufacturing is declining, the mining boom is over and competitor economies are forging ahead with technological innovation on the back of better education systems than we have access to in Australia. But instead, Abbott, at every opportunity, without scrutiny from the Press Gallery, goes straight to two boogeymen-under-our-beds as diversionary tactics to try to scare us into supporting his ideological agenda (which we’ve already proved we don’t like). These boogeymen are ‘debt and deficit’ and terrorism. The quest for the revered ‘surplus’ is akin to the government throwing all their resources behind an ideological holy grail, at the expense of Australian jobs and to increase household debt. It is nonsense, yet the Press Gallery don’t seem to understand this. Oh, and terrorism? According to this helpful analysis on Crikey, more people died in the past ten years falling off chairs in Australia, than they did from acts of terrorism here and overseas. What would you say if the Abbott government tried to make you scared of sitting down? These five elephants should be at the heart of any political discussion, at the heart of debate about policy and what is right for Australia’s future. But this is where the grand-daddy elephant needs to be pointed out. Political journalists in Australia are not interested in discussing policy. According to them, there was no need to discuss the effect that Abbott’s policy decisions have had on his current leadership-crisis predicament. No, as usual, the journos are as shallow as a puddle, with analysis such as this from Lenore Taylor, Laura Tingle, Laurie Oakes and Peter Hartcher. These articles all share two things in common; they perpetuate the myth that the Liberal government’s problem is all about Abbott and the dysfunctional processes around him, when really the entire government has helped create this situation by all sharing the same ideological agenda as Abbott. They all supported the turd, cooked the turd, and perpetuated the lies that brought the turd about. And now they’re all complaining that Abbott’s has failed to polish the turd and they want to give Malcolm Turnbull a go. But it’s Turnbull’s turd just as much as it is Abbott’s. Where is this analysis? And of course, they ignore the elephants I’ve described, whilst also ignoring the role the Press Gallery played in putting Abbott where he is, without scrutiny, without analysis, without a heads-up about what the country was about to experience. Rather than taking a step back and looking at themselves, they keep making the same mistakes over and over again. Exactly like Tony Abbott. The Australian public deserves better government. And we deserve a better Press Gallery to help explain what a better government would look like. It’s factually incorrect to claim we are “teetering on the edge of a recession”. We haven’t even had a single quarter of negative growth. It would be reasonable to say we are teetering on the edge of that, but not to go further. Totally agree, and unfortunately we can’t get any sensible analysis of the real state of the nation because any report or analysis that goes against government rhetoric gets a severe beating and then is ignored. I also think that all the journos pulled their heads in so as not to be seen as biased or left, especially those who are employed by the ABC. Those spineless ones are now starting to talk up a bit, perhaps only because idiot shock jocks have discovered some things about the Abbot government that they don’t like. Rosie Battie on ABC news saying no point government speaking against violence against woman while cutting frontline services.Some analysis of effectiveness of programs for men (which will be cut) followed.A short but effective analysis of policy.Well done ABC in this case. Even better would be some figures showing how much domestic violence affects the budget bottom line vs savings from cuts.Not difficult to do ,figures readily available and of much more interest than same old same old leadership spec. The many cogent insights elucidated by Ms Rollison in this column are thought-provoking and exceptionally sobering. Why don’t the members of our Fourth Estate independently guard the public interest by seeking out truths rather than mendaciously burying them or gormlessly distracting us from them? Why have a plethora of our MSM journalists been derelict in their duty to provide the mortar required for constant renovation of our harmonious and equitably prosperous democracy? Poor fellow, our country …….. we are rapidly sinking into the cesspool of egregious greediness and divisiveness that Reaganomics and Thatcherism have blighted their nations with as well as having battled mightily to infect the global economy with. This is Australia’s woeful fate if we are silly or dozey enough to reelect an extended reign of Captain Abbott (or some other saleable replicant who might soon arise out of the Coalition’s crew of fair-go demolishers) whose diabolical propaganda is concocted by Murdoch’s Minions and then regurgitated by lazy Fairfaxian ego-trippers and gutless ABCNEWS Copycatters.